Be the first to share your favorite memory, photo or story of Eunice . This memorial page is dedicated for family, friends and future generations to celebrate the life of their loved one. Westminster- Eunice Mae Garner, 80, passed away, March 21, 2019, at Seneca Health and Rehabilitation Center surrounded by her loving family. Born in Pickens County, she was the daughter of the late Howard Garfield Garner, Sr. and Bertie Mae Morgan. Eunice is survived by sister in law, Karen Garner of Huntsville, Alabama; caregiver niece, Sheila Moore of Westminster and several other nieces and nephews. 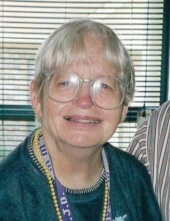 In addition to her parents, she is preceded in death by brothers, Tom Garner, Howard Garner, Jr, Henry Garner and Leroy Garner and sister, Ruth Ponte. The family will receive friends from 12 - 1 pm, Saturday, March, 23, 2019 at Sandifer Funeral Home. A graveside service will be held at 1 pm, Saturday, March 23, 2019 at Rock Springs Methodist Church. Burial to follow at Rock Springs Methodist Church Cemetery. The family is at their respective homes. Condolences may be expressed online by visiting www.sandiferfuneralhome.com. To send flowers or a remembrance gift to the family of Eunice Mae Garner, please visit our Tribute Store. "Email Address" would like to share the life celebration of Eunice Mae Garner. Click on the "link" to go to share a favorite memory or leave a condolence message for the family.